The Letters About Literature awards ceremony took place on Friday, May 2 in the rotunda of the Round House in Santa Fe. State Librarian, Devon Skeele, welcomed everyone and awards were then presented to the three New Mexico state champions who read their letters aloud, the three second place winners, the three third place winners, and the honorable mention letter writers. Audrey Rodriguez, a sixth grade student at Eisenhower Middle School in Albuquerque, is the Level 1 champion. Audrey wrote her letter to Lynda Mullaly Hunt about her book One for the Murphys. Leah Downey, a seventh grade student in Las Cruces, is the Level 2 champion. Leah wrote her letter to Deborah Ellis about her book The Breadwinner. Katya Waid from Mountainair, who is a ninth grade student at New Mexico Connections Academy, is the Level 3 champion. Katya wrote her letter to Harper Lee about her book To Kill a Mockingbird. Each of the state champions received a certificate acknowledging their achievement, $150 from the State Library, and a $25 gift card to Collected Works Bookstore. The second and third place winners also received a certificate and a $25 gift card for Collected Works Bookstore. All of the honorable mention letter writers received a certificate of accomplishment. 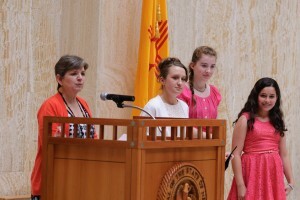 The three New Mexico champions’ letters were sent to the Library of Congress for the national competition. The winners of the national competition will be announced in early May. There were 532 New Mexico students who entered the 2014 contest. Of those 532 entries, 133 semifinalists advanced to round two state judging. In Level 1, there were 166 entries with 31 letters advancing to round two. In Level 2, there were 201 entries with just 40 letters advancing to round two. In Level 3, there were 165 entries with 62 letters moving on to round two. All of the state semifinalists who advanced to round two state judging were sent an award certificate in the mail. Letters About Literature encourages young readers to read a book and write a letter to the author about how the book changed their view of the world. The writers compete in the state contest to win $150 cash prize per competition level and a $1,000 cash award per competition level in the national contest. This is the second year New Mexico State Library has sponsored the competition. For more information about New Mexico’s Letters About Literature contest, please email lori.thornton@state.nm.us or call Lori Thornton at 505-476-9717. Thank you to all the students, teachers, librarians, and families who participated in New Mexico’s Letters About Literature program. Keep reading and writing!